Reduce the need for endless development and test cycles by testing on a simulated network with all the characteristics of your customer’s network, and then deploy with confidence. Use JAR:emulate to performance test under the wide variety of network characteristics your software will be required to perform on; identify, trouble shoot and resolve related issues before these become customer facing problems. The JAR:emulate series provides multiple independent emulation links that can be tailored to your exact requirements through a simple ‘drag and drop’ user interface. No programming or deep technical expertise is required. Open XML protocol ensures full integration with automated testing. Ensure application performance via a real time reporting suite, traffic analyser, traffic record /playback and advanced filtering. ‘What if’ scenario building to evaluate network changes – evaluate different topologies and technologies before expensive implementation. For example evaluate WAN Acceleration Technology: Determine how different WAN optimisation products will perform under the best/average/worst conditions of your network. 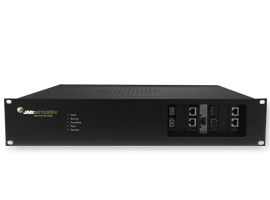 The virtual routing feature allows each physical port on the emulator to act as a dedicated router, transforming the capabilities provided and allowing users to simulate multiple network segments. Each network segment can be interconnected using its own unique bi-directional impairments to simulate data center connections, consumer networks or remote office environments. As you would expect each virtual router provides fully configurable DHCP (or Static) IP addresses, routing tables, ARP and ICMP services. Using JAR:emulate’s flexible nature you can simulate link fail overs in routed networks or create routing problems to see how your infrastructure copes. JAR:emulate marries control with ease of use: emulation is carried out by visualising the movement of data packets through your chosen WAN topology. Packets enter via a physical port, pass through the required impairments, and exit through another physical port. To aid design JAR:emulate provides an intuitive range of on-screen objects representing different features, such as physical ports, bandwidth throttles and packet corrupters. These are simply ‘drag and dropped’ to form your desired network emulation map. JAR:emulate’s flexibility extends to Wireshark, the award winning protocol analyser. Through Wireshark JAR:emulate provides packet and stream capture and detailed analysis of all traffic passing through your emulation. Perform root cause issue analysis and ensure test repeatability by replaying recorded network traffic until resolution. Reporting is an essential part of understanding how your software is coping under different network conditions – what’s working, what’s not and crucially why. JAR:emulate can be shipped with built in reports such as packet loss, bandwidth, TCP operations, web client operations, etc.